InfuSystem Holdings Inc (NYSEMKT:INFU) stock has been quietly advancing since the stock price hit a low in January. In the last two months, the INFU has appreciated by over 40% and is within $0.12 (3.3%) of breaching its prior 52-week high. INFU gained 3.46% at the end of the week on volume that was twice its daily average reaching 63,000 shares trading hands. INFU is a microcap company with 22 million shares outstanding and $83 million market valuation; yet the company has been posting impressive earnings and revenue for a microcap. The company recently released its fourth quarter 2015 and full year 2015 results. The results were outstanding and INFU scored big on all major financial performance metrics. Net revenues increased to $72.1 million or 7% mainly from an increase in rental revenues. Net income surged to $3.7 million for the full year 2015 and INFU reported EPS of $0.16. This puts the company at a P/E ratio of 22 and a little over 1 for a price to sales ratio. 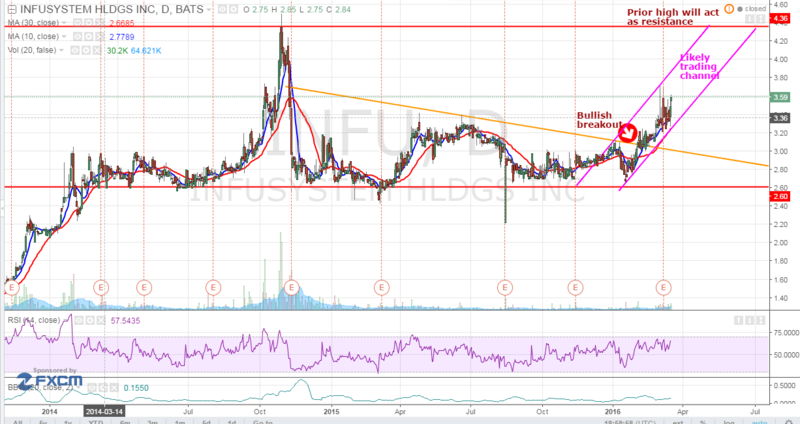 If INFU can continue to grow revenues and earnings, the stock should be an easy win for investors and shareholders. Fourth quarter results were even more impressive compared to the same period in the prior year. Net revenue surged 20% to $19.5 million and net income skyrocketed to $2 million locking an increase of 20%. EPS hit $0.09, more than half of its earnings for the full year in the 4th quarter. AEBITDA increased 30% to $6 million. InfuSystem Holdings Inc (NYSEMKT:INFU) is a leading provider of infusion pumps and related services to hospitals, oncology practices and other alternate site healthcare providers. INFU’s core service is to supply electronic ambulatory infusion pumps and associated disposable supply kits to oncology clinics, infusion clinics and hospital outpatient chemotherapy clinics for cancers. The Company sells or rents new and pre-owned pole mounted and ambulatory infusion pumps, and provides biomedical recertification, maintenance and repair services for oncology practices, as well as other alternate site settings, including home care and home infusion providers, skilled nursing facilities, pain centers and others. INFU is currently trading at an $83 million market valuation. INFU’s management is solid and is executing on its strategy. It has been making the right investments to grow and gain market share. INFU posted solid financial performance and expects to continue going into 2016. Stay tuned as this stock will likely be a big gainer in 2016 or 2017. We will be updating on INFU when more details emerge so make sure you are subscribed to Microcapspot so you know what’s going on with INFU. Disclosure: we hold no position in INFU either long or short at the publication of this article and we have not been compensated for this article.